Yes, We Are Still Cruising! Back in the U.S. I know, I know. It has been WEEKS since our last post. 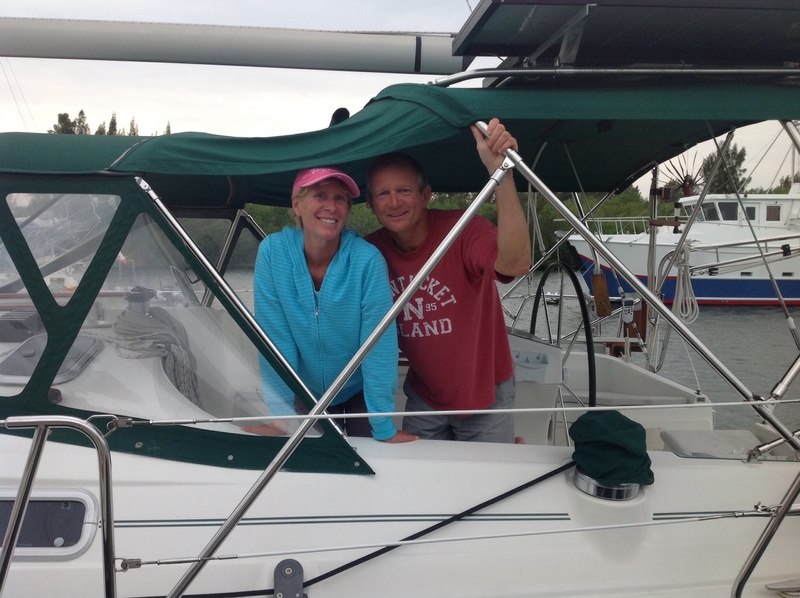 It was a winter interruptus, but now we are back on the boat and cruising along nicely. Let me try to efficiently get you caught up. Last post I had shared that we’d lost my brother-in-law, Frank. The residents of Eleanor Q packed up and flew back to NJ for the services and to be with family. 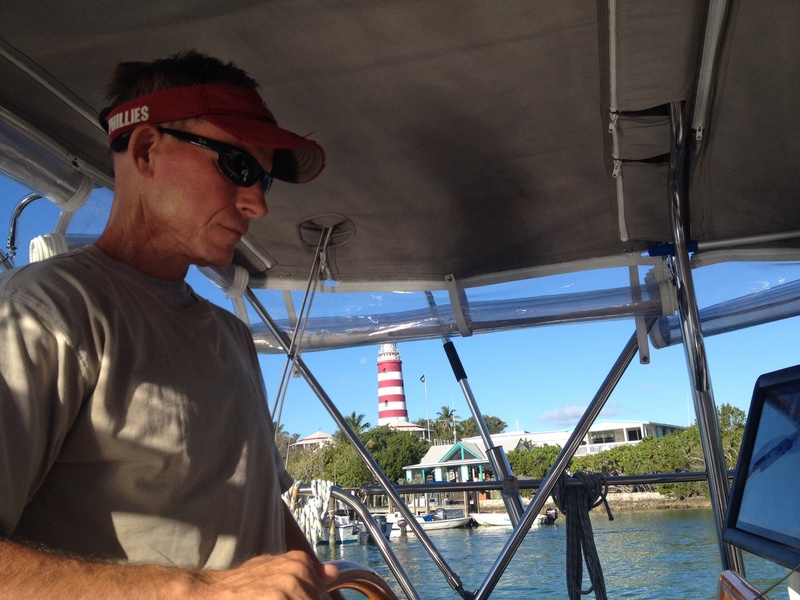 It was Ems’ second trip off the boat flying from Marsh Harbor airport in the Abacos. Frank took some time while we were in the area to hang out with his son, Frank, for a while – always a good thing! We returned to the boat and the following week was a blur. We were still recovering from an emotional trip and then had to start planning for our passage back to the U.S. Months ago I had booked a little bit of work back in Pennsylvania/NJ area for early April. For that and a number of other reasons, it was time for us to get back to the states. 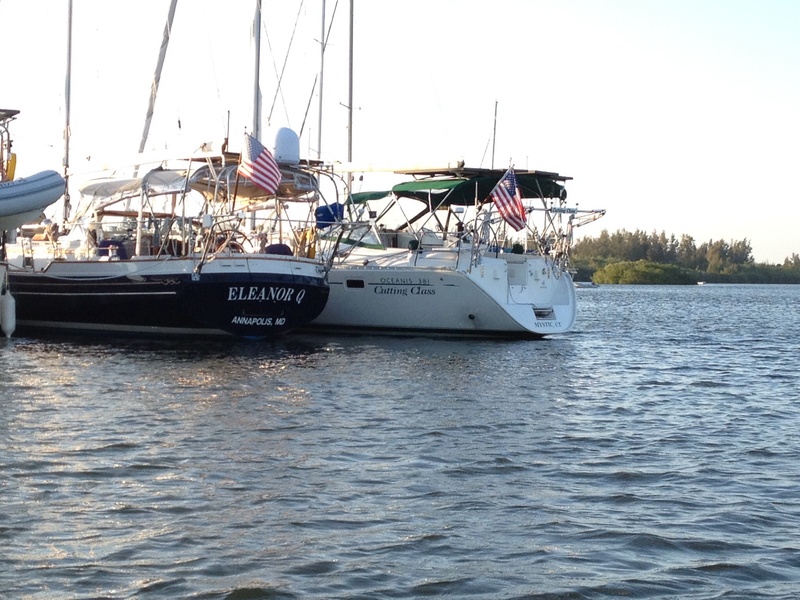 Eleanor Q enjoyed her month long parking spot in Hope Town, and we enjoyed the area and the people there very much. 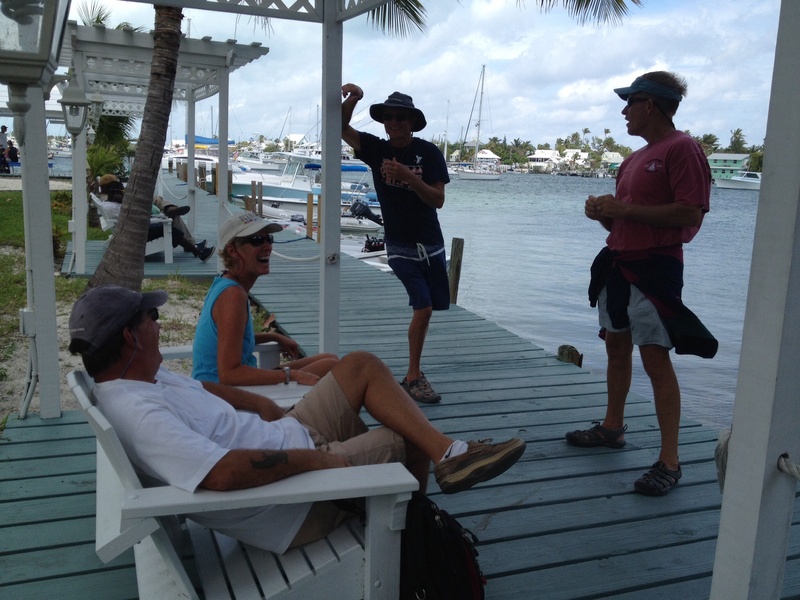 We hope to get back to the Abacos in the future and see some of the other cays that we missed this time around. You can’t do it all! So on March 20th, we were underway again! 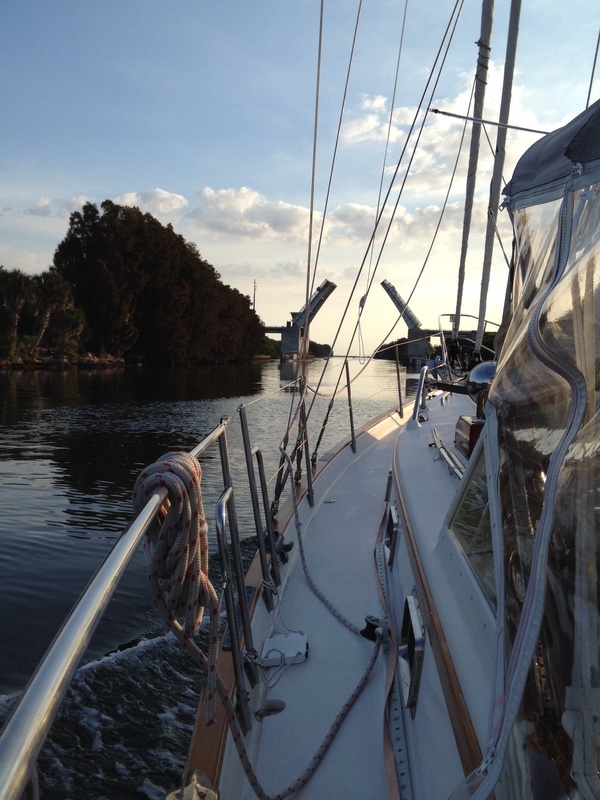 We left Hope Town for Spanish Cay for the night and then went straight from Spanish Cay across the Gulf Stream, into Ft. Pierce inlet in Florida and straight up to Vero Beach. It required an overnight passage. The trip took about 30 hours. 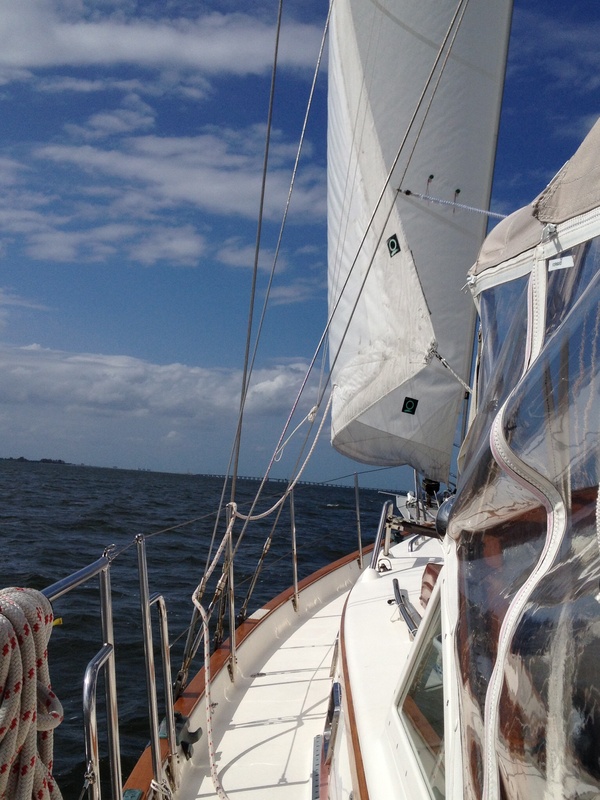 It was sporting but exhilarating and we were so happy to be back underway. I think we needed to blow some of the cob webs out of our heads at that point and get focused back on cruising. With each overnight, we both get more confident with my ability to be in the cockpit for 3 hour shifts at night alone. And I wasn’t very alone . 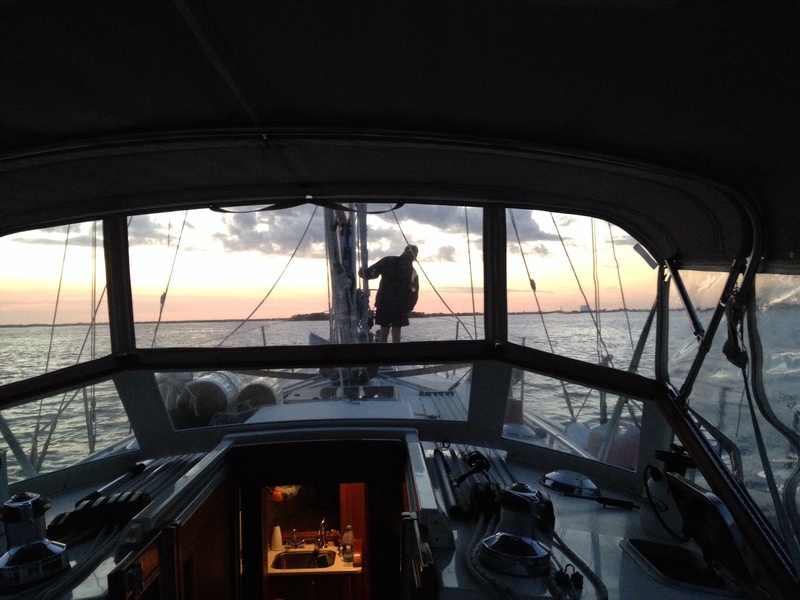 . . we were crossing with Magnolia and two other boats that we met in the previous days. We established the hourly check in system on the radio and called each other if someone spotted a tanker on their radar or AIS system first. For the first time, Frank and I both truly slept on our 3 hour breaks which made us both a lot better off upon arrival! 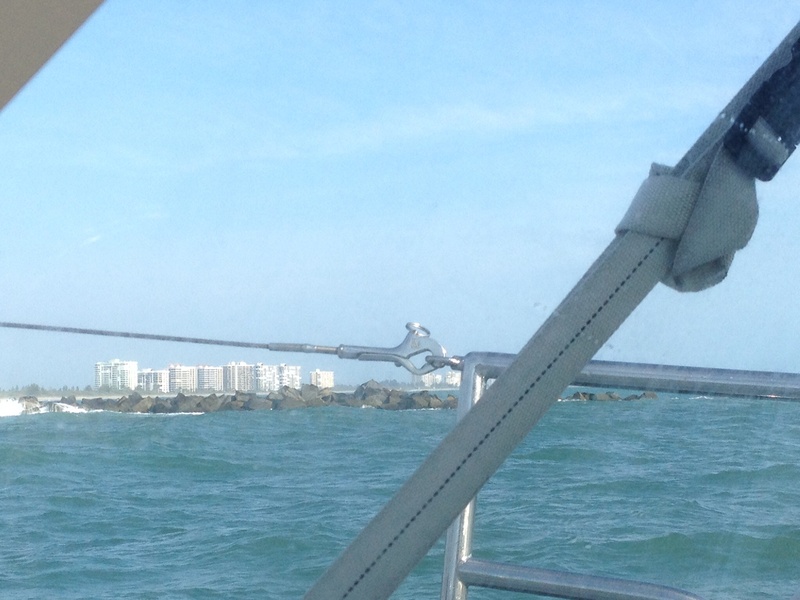 We found a busy Vero Beach and ended up rafted three deep on a mooring ball, but one of our neighbors were our new friends from Cutting Class. We had met them in Hope Town and spent some time with them there. Magnolia, Cutting Class and Eleanor Q had a fun four days in Vero, and then we once again hopped on a plane and headed to New Jersey. Frank came with me for the first part of the trip since he was STILL dealing with ongoing dental issues that really needed some attention for real. Plus any chance for him to hang out with Frank and Nicole is excellent! It was very strange, at first, to be back in “work mode” and facilitate training classes, but there was a part of it that felt very good, too. I put on my adult clothes and make-up, broke out the blow dryer and curling iron and acted like a professional for a few days. I did have to laugh . 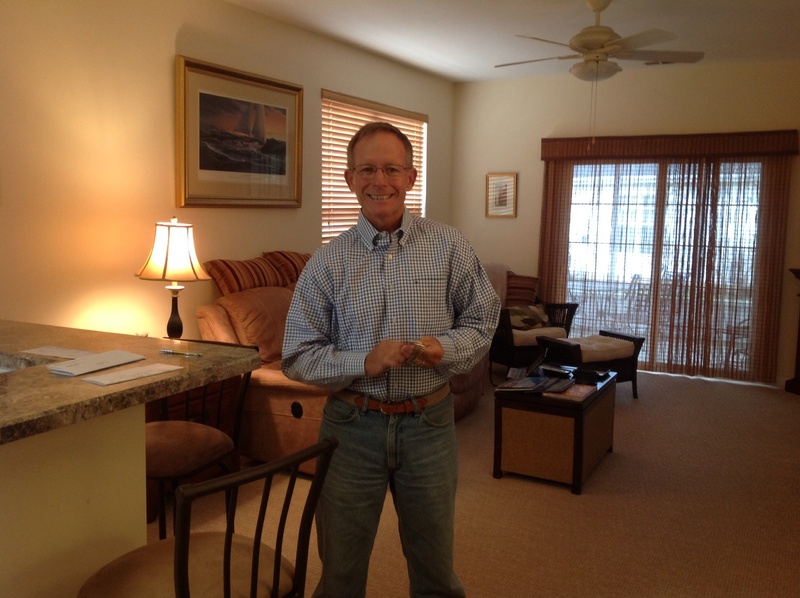 . . the one client I worked for is Frank’s former employer, and they have been a client of mine for close to eight years. There are people at the company that follow the blog who didn’t have any reason to know that I’d be around teaching. I ran into two of those people in the hallways. They both blinked, looked confused and said, “Wait. Why aren’t you on the boat? And why haven’t I gotten a blog in a while?” It made me smile. Thanks for reading, John and Tom!! As much as I enjoyed the work, I was extremely homesick for the boat and for Frank who had flown back several days ahead of me. 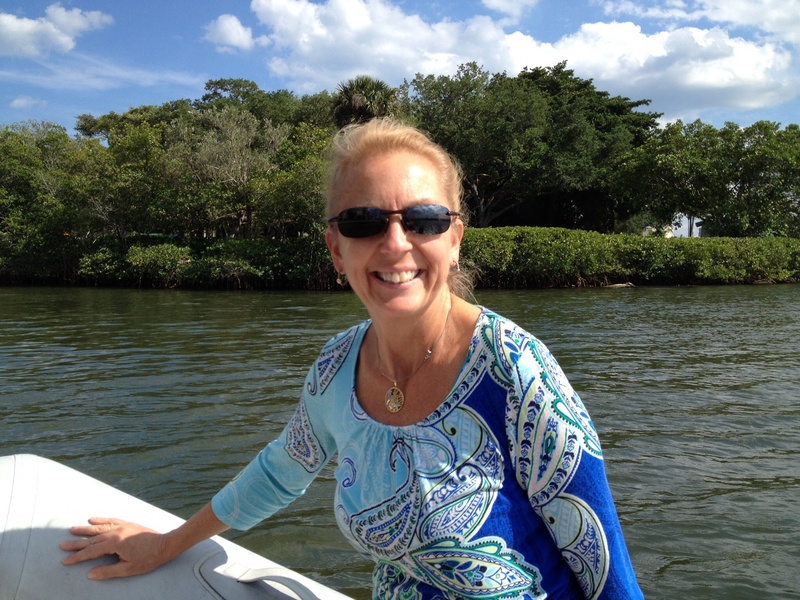 I don’t think I’ve ever felt so happy to get back on the boat than I did that Wednesday when I returned to Vero via the West Palm Beach airport. Now we’re back on the boat heading north. 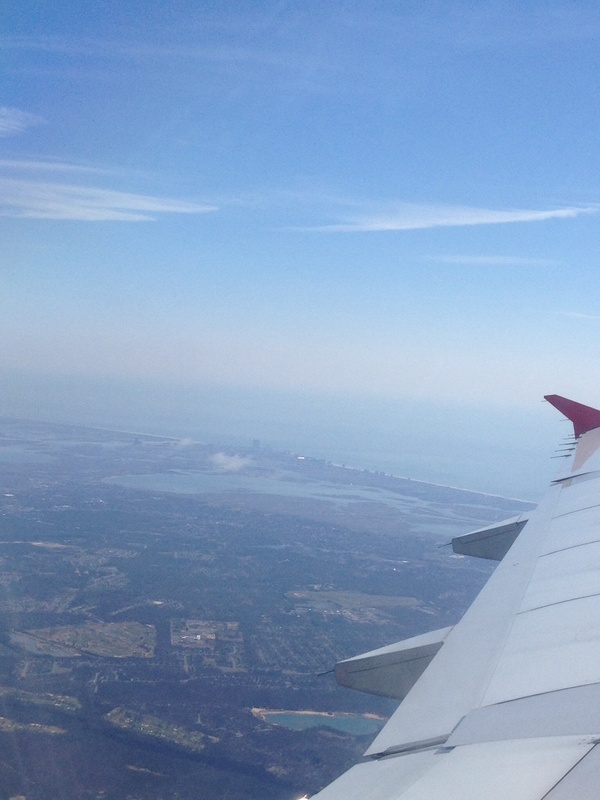 We’ve stopped in Titusville, Daytona Beach and are currently in St. Augustine, FL for a brief visit. We project a landing in Annapolis area around the third week of May and look forward to seeing a lot of cool stuff along the way. So stay tuned . . . the blogging has resumed. Here are the pictorial headlines of what we’ve been up to . 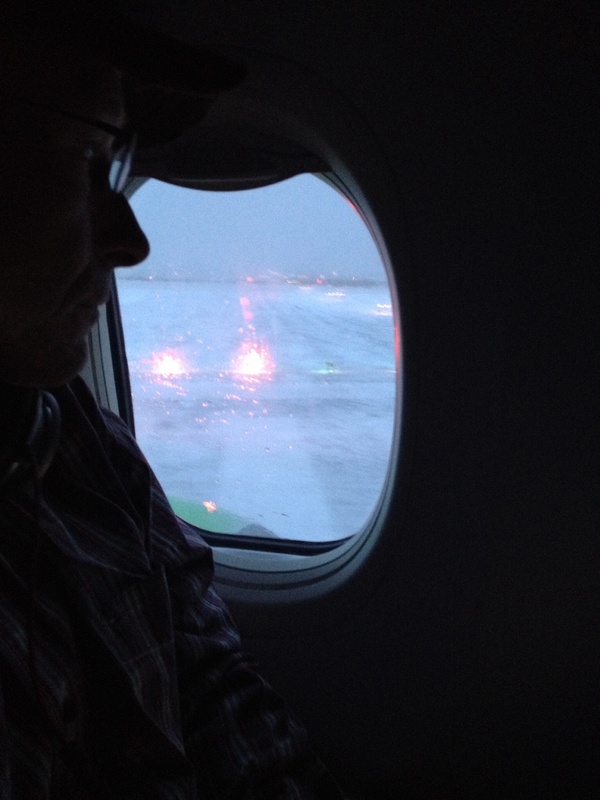 . .
March 17th, taking off from a very snowy Philadelphia airport. 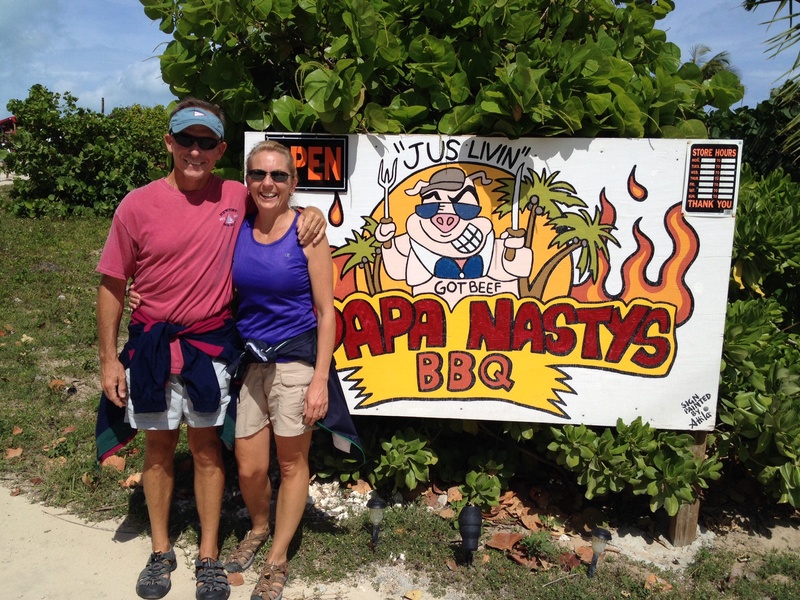 Enjoying our last few days in Hope Town including BBQ at Papa Nasty’s! Most excellent. One of our favorite hangouts, “Wine Down Sip Sip” – with a great wine selection and excellent flatbread pizza! Coming back from a long walk with Magnolia and Cutting Class . . . had to work off the BBQ! Okay, really rough laundry duty. 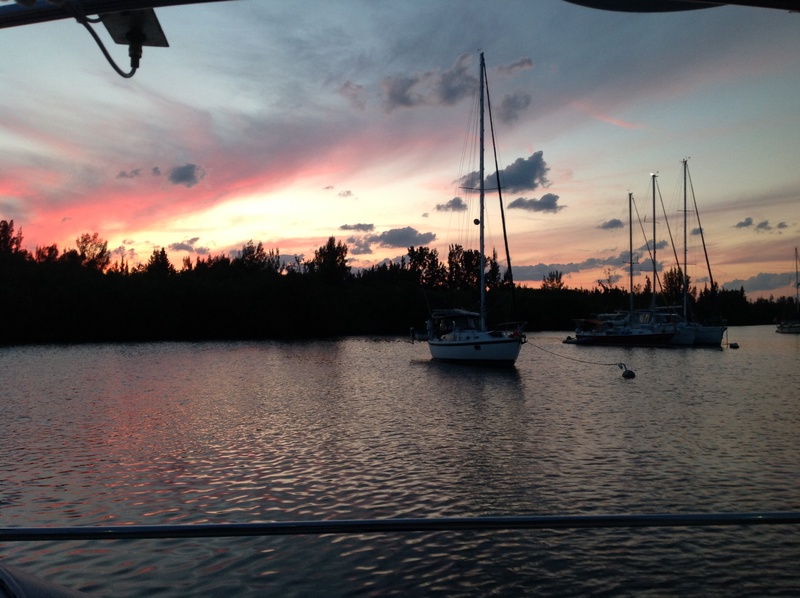 We had access to the marina since that’s who leases the mooring ball we were living on. 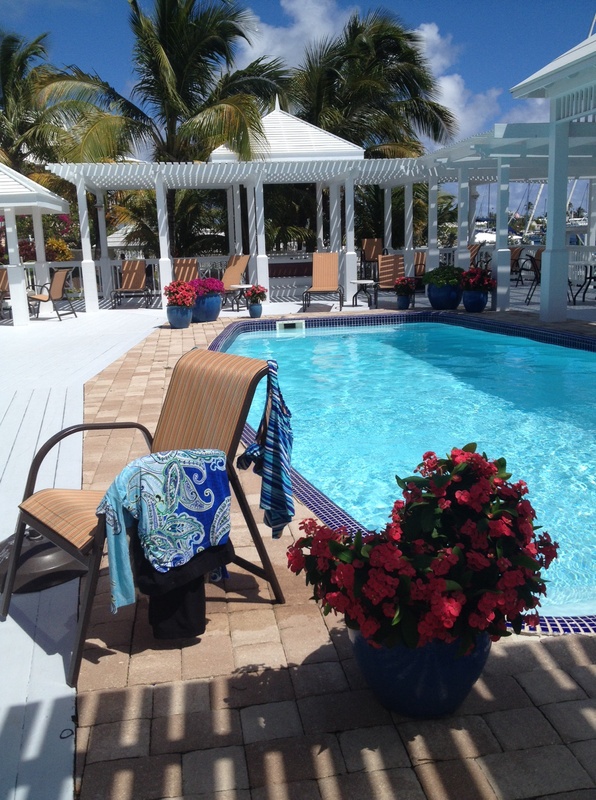 Here’s how it goes: throw laundry in washer – sit by the pool – throw laundry in dryer – sit by the pool. Very stressful. Best laundry ever! I had a few things drying on the lounge chairs. And it’s time to say goodbye to Hope Town . . . we’ll see that iconic lighthouse again some day. 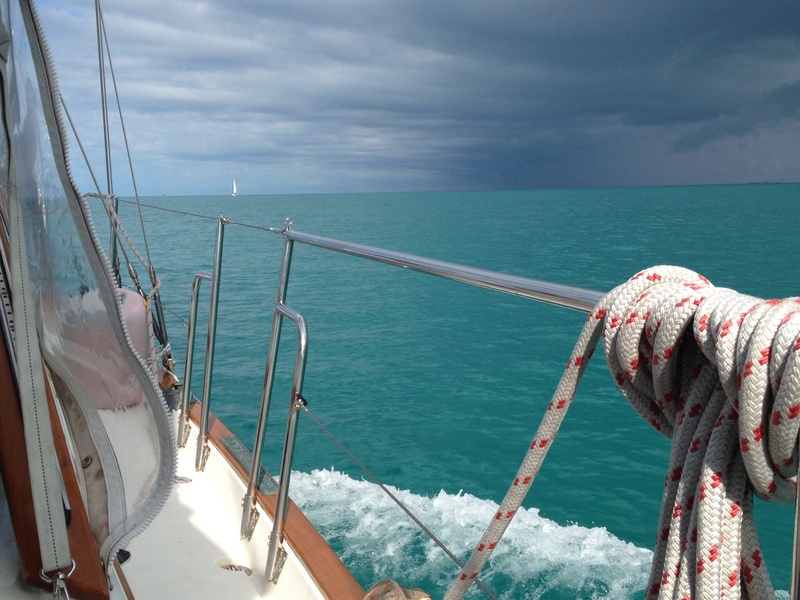 We were lucky to dodge a few squalls in the area as we made our way across the Sea of Abaco and away from Spanish Cay. 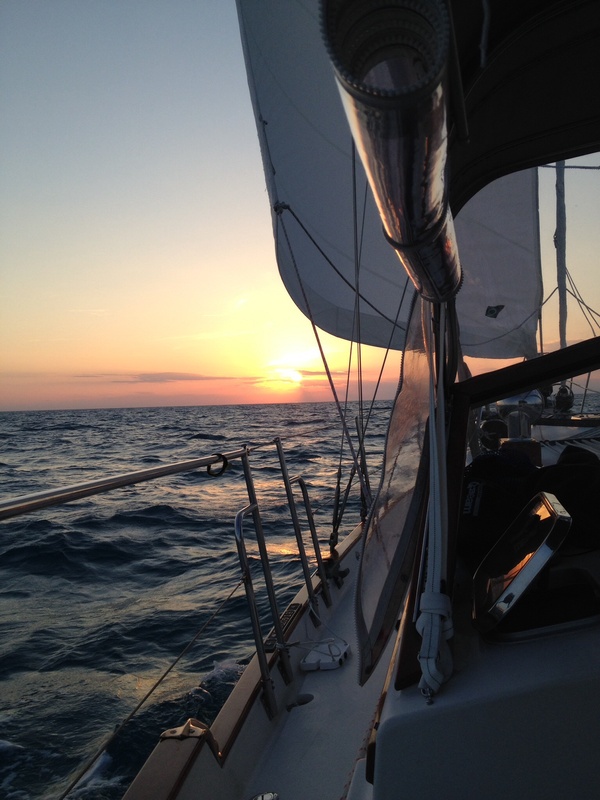 Underway to the US and watching the sunset over choppy waters. 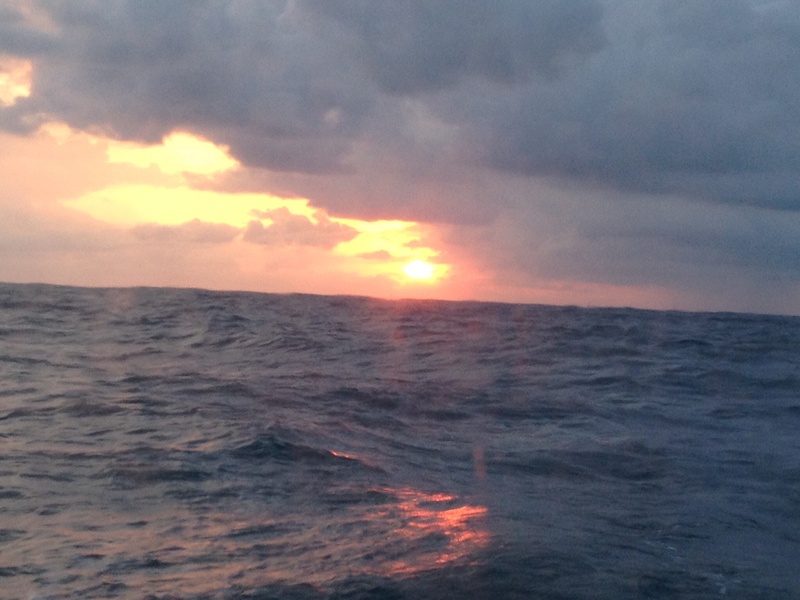 And dodging more squalls as we look behind us at sunrise as we approach the coast of Florida. I don’t think we ever saw more than a sprinkle. Guardian angels . 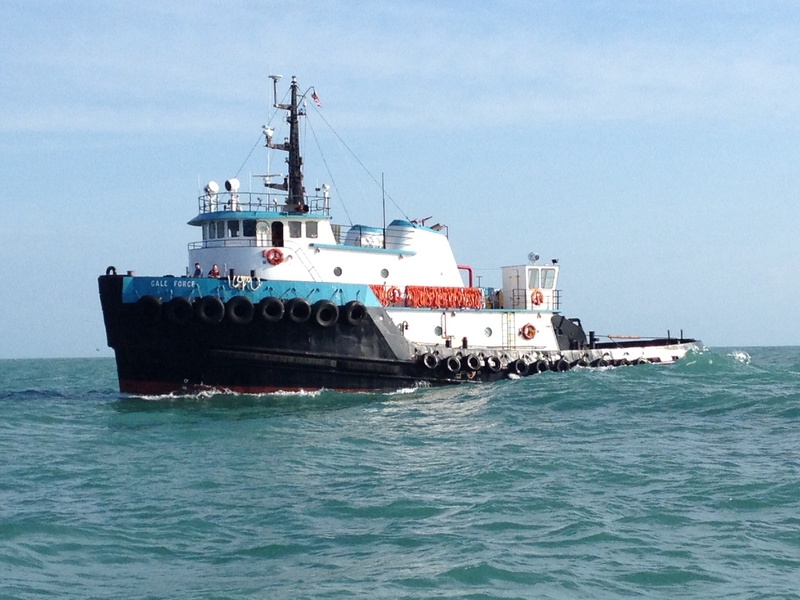 . .
And then dodging a tug boat pulling a barge as we race him to the Ft. Pierce inlet. We were determined not to get stuck behind him at the inlet and he was very accommodating. Re-entering civilization(?) – high rises and lots of bridges. We hadn’t seen those for a while! 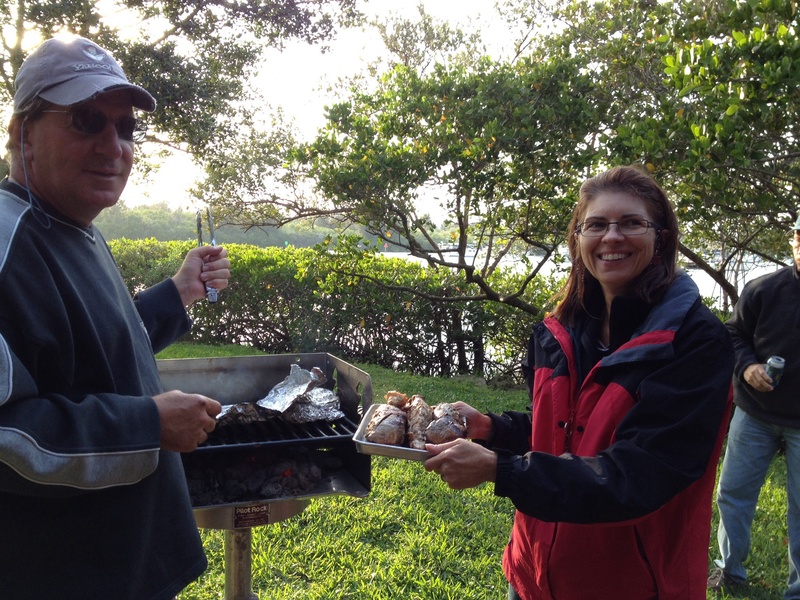 We enjoyed a cookout on the marina grounds at Vero with Anthony at the grill and the lovely Ms. Annette assisting. How do you know you’re back in the U.S.? 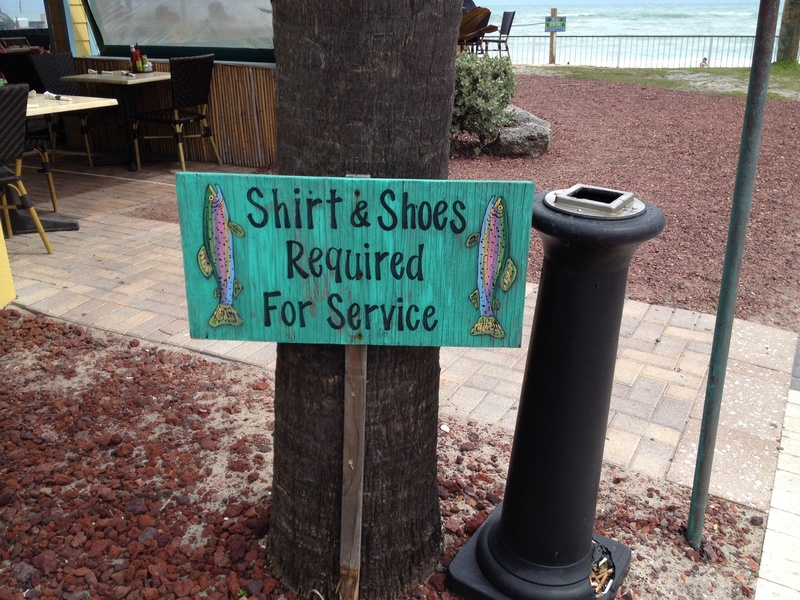 They actually expect you to wear SHOES in restaurants!! It is a weird transition back into the land of rules and noise and over-stimulation. 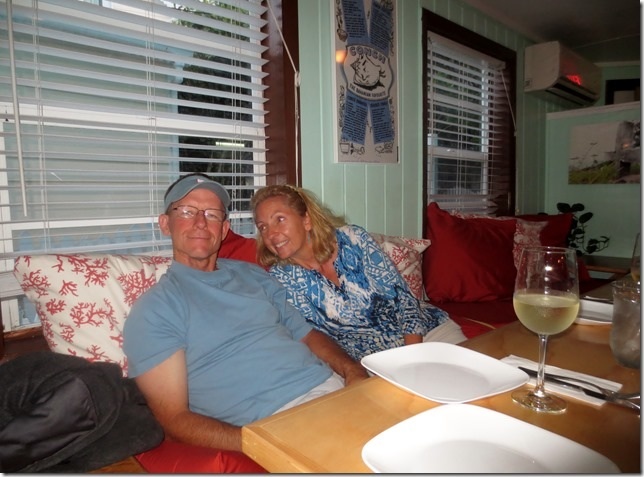 Marcia and Dan from Cutting Class – yes, retired teachers. Great boat name!! And here we are flying . . . again. Frank is showing off some of his dental work, two root canals later. This is the place we moved to last year after leaving Harrisburg. It feels like a vacation condo since we’ve spent so little time there. I still can’t find anything in the kitchen! Ems VERY happy to be getting shuttled back to Eleanor Q after her “work” trip. Notice the lack of tan here. 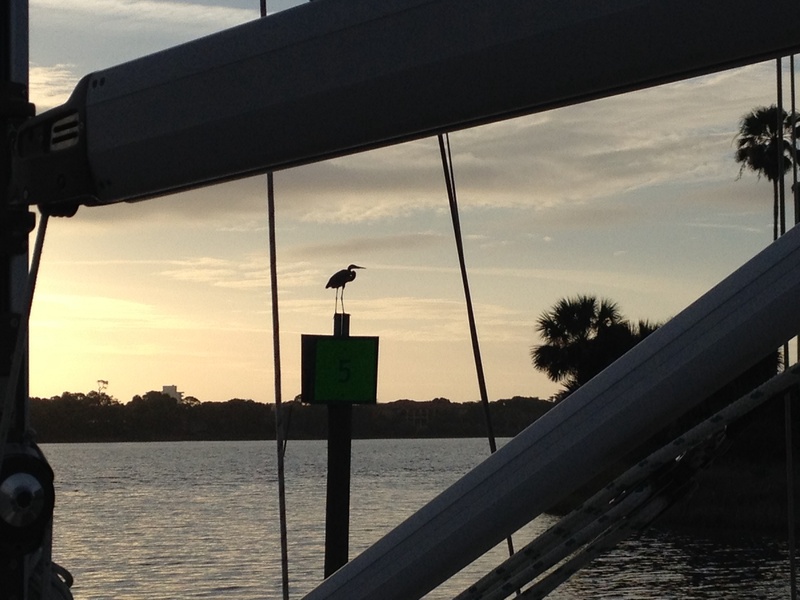 An early morning departure from Vero Beach, FL. Ems taking her turn at the helm. 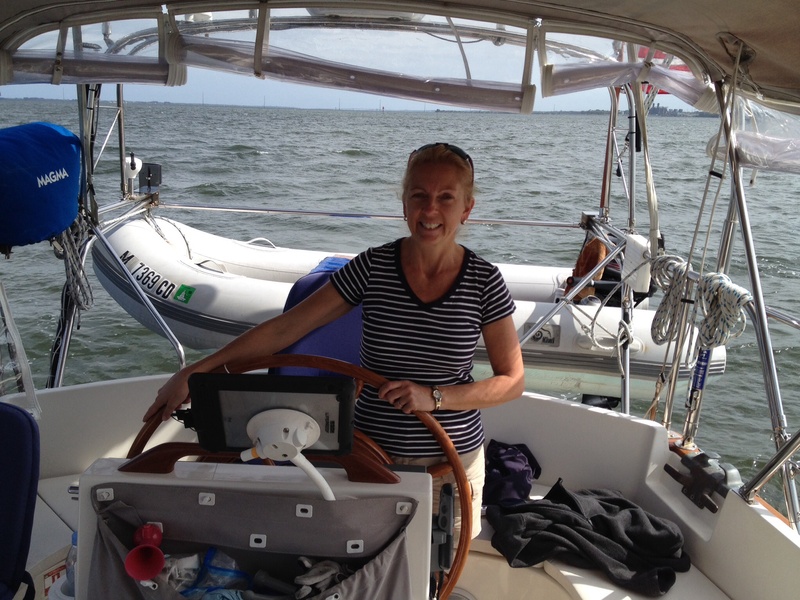 A nice day of motor sailing on the ICW! We had an audience watching us go under a bridge. I think the one in the middle looks a little judgmental. My sister Christine saw this picture and commented that that must be the “poop deck” they’re sitting on. You can always count on Christine for those witty observations! 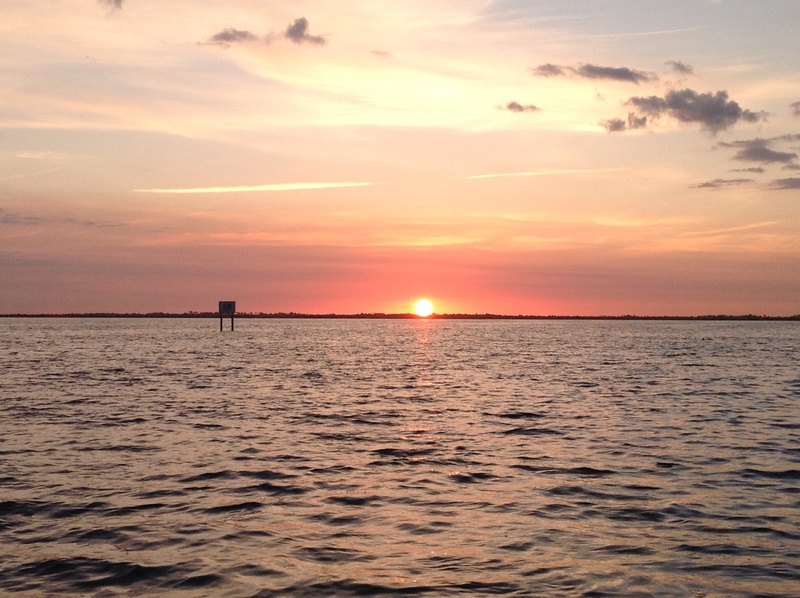 We had a pre-dawn departure from Titusville in an attempt to make it to Daytona Beach around lunchtime. And we were rewarded with a beautiful sunrise! And we are back to the land of draw bridges, too! For all the highrise areas you see in Florida, you see at least as much of the ICW that looks like a wildlife preserve! It is beautiful. 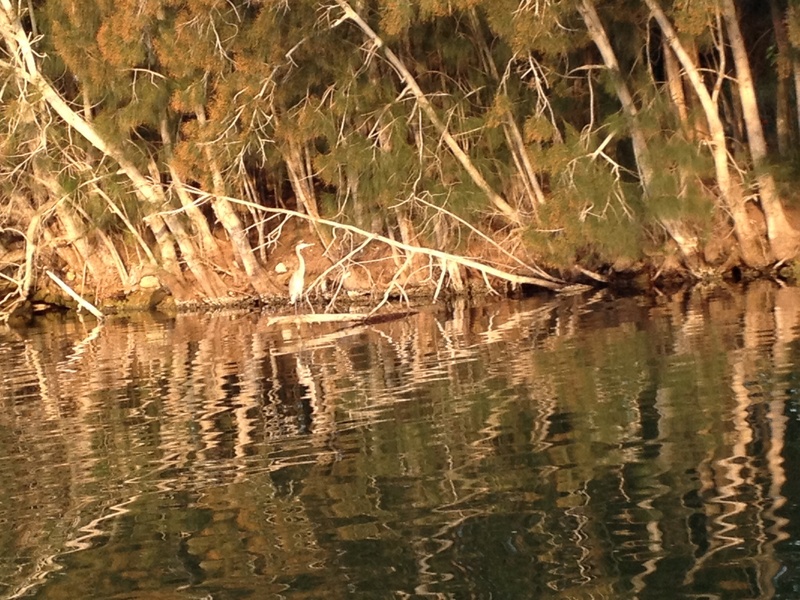 Can you spot the heron in this picture? We got to see our friends Anne and Bob in Daytona again. Here we are checking out what we think was a loon! It certainly sounded like it. By the way, Anne does an amazing duck call just blowing through her fingers. No lie, ducks actually came!! I gotta learn how to do that. 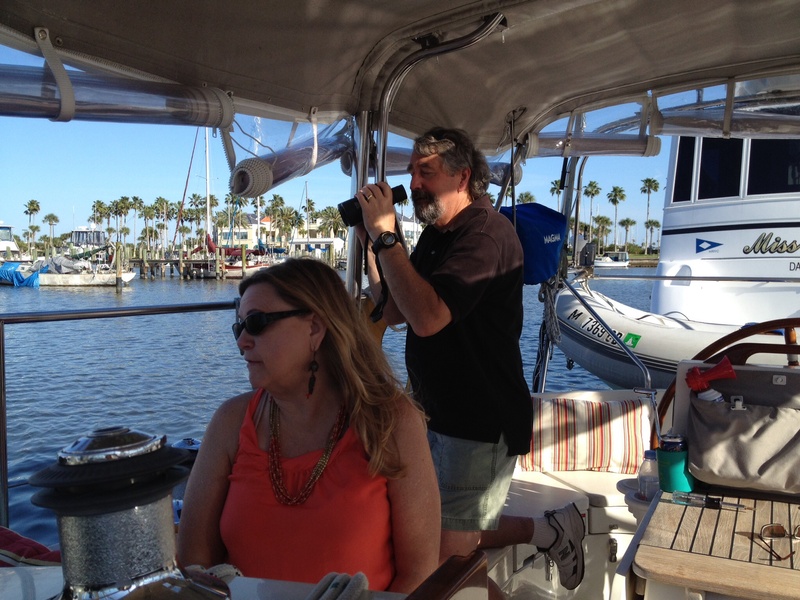 And we have another feathered observer supervising our departure from the Halifax River Yacht Club in Daytona Beach – a really wonderful facility with the best staff.